Bennett Awards created new, unique custom awards for the 2018 Rugby World Cup Sevens. The tournament is the largest stand-alone rugby sevens competition in the world outside of the Olympic Games. The 2018 tournament featured the top 24 men’s and top 16 women’s teams in the world, spanning 84 matches in total. For the first time, teams competed in a straight-up knockout format. 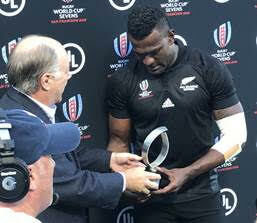 The event was held July 20-22, 2018, at AT&T Park in San Francisco, and was the biggest rugby event that has been staged in the U.S.
Bennett Awards created new custom trophies for both the men’s and women’s most valuable players. These awards were sponsored for UL (Underwriters Laboratories), and were called the UL Mark of Excellence Most Valuable Player Awards. Bennett Awards worked with the award sponsors and tournament organizers to create a new custom award design for these trophies. The trophy design featured a unique abstract geometric sculpture inspired by the event logo. The sculpture awards were cast in pewter with a brushed pewter finish. The sculptures were then mounted on black bases with engraved plates featuring sublimated engravings of the award name, event logo, and sponsor logo. Both the men’s and women’s competitions were won by New Zealand. 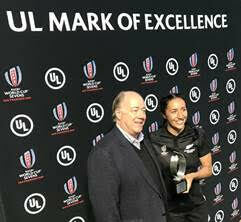 The recipients of the MVP trophies were Joe Ravouvou of New Zealand on the men’s side, and Sarah Gross of New Zealand on the women’s side.